Every Monday, on the Pennsylvania College of Art & Design blog, a different profile of an artist is posted. These are taken from a classroom project where the illustrations and fine art students create “Artist Trading Cards,” first researching the facts about and the style of a selected artist, then making a trading card that captures the spirit of the artist. Three PCA&D sophomore illustration majors, Abigail Bonett, Ariana Pluchinsky and Ashley Obenstine, haven taken us through their Art Card Projects in this and previous blogs. I first learned of Toyin Odutola’s work when she visited PCA&D in Fall 2014. I loved the reasoning behind her subject matter and how she renders. Ever since then, I’ve kept track of the new pieces she puts out. Women, especially women of color, need to be represented more often in society in any way possible. That was one of the deciding factors in my choosing Odutola. I’m Ashley Obenstine and I grew up and currently still live in Elizabethtown, PA. I attended & graduated from Elizabethtown Area School District & CCTC for Commercial Art. My freshman year, I went to Tyler School of Art (part of Temple University). I took a year off school and transferred to PCA&D. I am now an Illustration major and hope to work in the comic book industry, animation industry, or possibly do character design or concept art. I like a lot of things, so it’s hard to decide right now! This went through multiple comps. I really wanted to get her skin tone right and capture her personality. I was unhappy with the first two, and then finally rendered out a piece I was happy with. The entire piece is painted digitally in photoshop. I used a few different brushes in different areas. I used my wacom bamboo tablet for this, and I have to say I'm pretty happy with the outcome. I worked off one photo of her but I didn't want to do a realistic painting. So, I really just tackled it in my own style that I enjoy drawing in and focused on capturing her separate features and outgoing personality. Famous work: Rather Than Look Back, She Chose to Look At You, Part of the “Of Another Kind,” (2013-2014) Series. Toyin Odutola received a BA in Communications and Studio Art from the University of Alabama in 2008, and received her MFA in 2012 from California College of the Arts. She is best known for her self-portraits, mostly and even sometimes entirely done in black pen ink. Besides pen ink, Odutola has worked with india ink, acrylic, watercolors, acrylic ink, graphite, markers, charcoal, pastel, lithography crayon, colored pencil, and wood stain on paper, board, and wood. She states that her works “draw together the striated terrain of skin, the materiality of color, and how to broaden the platform of portraiture to create a narrative of place”. 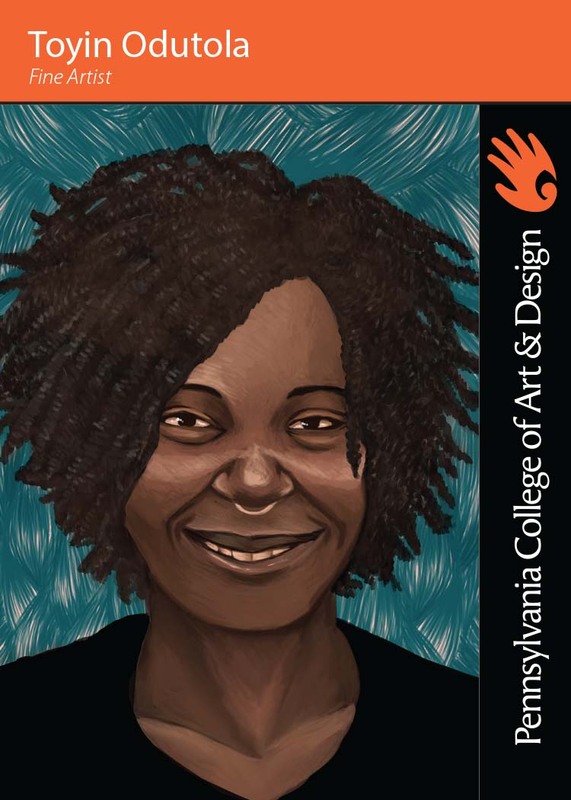 When Odutola visited PCAD in 2014, she stated that to get the outcome of her portraits, she overworks the skin. Note: Toyin Odutola was a featured artist for Pennsylvania College of Art & Design ‘s 2014 Mosaic Project, an annual multicultural exhibition and education program for the residents of Lancaster County, PA. The project combines two key components to serve the educational and artistic needs of the community: inviting artists to exhibit works and partake in projects with locale students (from Middle and High School to undergraduate), such as drawing workshops and artist talks. Toyin Odutola was involved in the 2014 interaction, in a two-person exhibition with photographer Lydia Panas.